Hypothesis Laparoscopic adrenalectomy (LA) is most commonly performed for pheochromocytomas (PHEs) and aldosteronomas (ALDs). We hypothesize that LA for these differing tumor types is associated with different operative courses and outcomes. Design Retrospective study of a 10-year experience with LA. Patients Laparoscopic adrenalectomy was performed on 149 patients. During data analysis, the initial 35 LAs performed for various adrenal lesions were excluded to account for the learning curve. Twenty-six of 30 PHEs and 34 of 45 ALDs were included. Main Outcome Measures Analysis of variance was used to compare operative time, tumor size, estimated blood loss, and postoperative length of hospital stay between the PHE and ALD groups and subsets of these groups. χ2 Analysis was used to compare tumor location, transfusion requirements, conversion to open procedures, and incidence of major complications. Results Right-sided lesions occurred in 19 of 26 PHEs, and left-sided lesions occurred in 28 of 34 ALDs (P <.001). Mean ± SD tumor size of PHEs (4.9 ± 1.8 cm) was larger than that of ALDs (2.7 ± 1.7 cm) (P <.001). Mean ± SD operative time for PHEs vs ALDs was 191 ± 49 vs 162 ± 48 minutes (P = .02). Mean ± SD estimated blood loss was greater for PHEs (276 ± 298 mL) than for ALDs (196 ± 324 mL) (P = .33). Subset analysis revealed that the mean ± SD size of right-sided PHEs (5.3 ± 1.8 cm) was significantly larger than that of right-sided ALDs (3.0 ± 1.5 cm) (P=.001). Mean ± SD operative time for right-sided PHEs (198 ± 44 minutes) was longer than that for right-sided ALDs (145 ± 37 minutes) (P=.005). Six PHE patients required blood transfusions vs 2 ALD patients (P = .05). Two LAs, 1 PHE and ALD, were converted to open procedures. Mean ± SD length of hospital stay was longer for PHE patients vs ALD patients (4 ± 4 vs 2 ± 3 days; P = .08). Six PHE patients had complications vs 3 ALD patients (P = .13). Conclusions For PHEs, LA was associated with the removal of more right-sided lesions, larger tumors, longer operative times, and more complications. Trends toward greater estimated blood losses and longer hospital stays were observed for PHEs vs ALDs. Despite the advanced skills of an experienced surgeon, LA for PHEs is associated with a more complex course than for ALDs. Surgeons should begin performing LA for ALD early in their experience to avoid the potential pitfalls associated with PHEs. Since first being described in 1992, the laparoscopic approach for the surgical resection of adrenal disease has gained wide acceptance. Its advantages compared with the open approach have resulted in laparoscopy becoming the preferred method for the resection of many adrenal lesions.1-5 The laparoscopic approach for the treatment of aldosteronomas (ALDs) is generally accepted. Laparoscopic adrenalectomy (LA) for pheochromocytoma (PHE) has also received favorable reviews owing to its improved ability to visualize adrenal pathology and minimize manipulation of the tumor, resulting in decreased catecholamine release.6 The 2 most common indications for LA are ALD and PHE. The objective of this investigation is to review a single surgeon's 10-year experience with LA at a university hospital. We hypothesize that these different tumor types affect the operative course and clinical outcome of patients undergoing LA. A retrospective analysis of the medical records of 149 patients who underwent LA by a single surgeon (R.A.P.) was conducted. All LAs were performed between January 1, 1993, and December 31, 2002, in a tertiary care university teaching hospital (Rush University Medical Center). Seventy-five patients (38 women and 37 men) were identified as having undergone LA for either a PHE or an ALD. The 74 patients excluded from this study were those who had undergone LA for adrenocortical hyperplasia, nonfunctioning adrenocortical adenoma, ganglioneuroma, or myelolipoma. Of the 75 patients included in this study, 30 had a PHE and 45 had an ALD. Before data analysis, the initial 35 of 149 LAs performed were excluded to account for the learning curve, which eliminated 4 PHE patients and 11 ALD patients. Ultimately, 26 of the 30 PHE patients and 34 of the 45 ALD patients were included in the data analysis. Analysis of variance was used to compare operative time (ORT), tumor size, estimated blood loss (EBL), and postoperative length of hospital stay (LOS) between the PHE and ALD groups and between PHEs and ALDs specifically within subsets of left- and right-sided lesions. Similarly, analysis of variance was used to compare the same variables between left- and right-sided lesions specifically within the PHE and ALD groups. χ2 Analysis was used to compare tumor location, transfusion requirements, conversion to open procedures, and the incidence of major complications. Pearson correlation analysis was performed to evaluate the relationship of the specific tumor type to the tumor size, EBL, ORT, and LOS within the PHE and ALD groups. The performance of a concomitant procedure, use of intraoperative ultrasound, and type of laparoscopic approach were also recorded but were not statistically evaluated. P ≤.05 was considered significant. Data are given as mean ± SD. The 26 patients with a PHE (19 women and 7 men) were aged 44 ± 13 years (range, 19-68 years; median, 46 years), and the 34 patients with an ALD (14 women and 20 men) were aged 49 ± 10 years (range, 29-79 years; median, 50 years). Nineteen of the 26 PHEs were right sided and 28 of the 34 ALDs were left sided (P <.001) (Table 1). The ORT for the laparoscopic removal of a PHE was 191 ± 49 minutes, and that for the removal of an ALD was 162 ± 48 minutes (P = .02). Laparoscopically removed PHEs were significantly larger than ALDs (4.9 ± 1.8 vs 2.7 ± 1.7 cm; P <.001). The EBL after resection of the PHEs was 276 ± 298 mL, and that after resection of the ALDs was 196 ± 324 mL (P = .33). Six PHE patients required blood transfusions vs only 2 ALD patients during a 24-hour perioperative period (P = .05). Subset analysis of left-sided lesions demonstrated no differences in tumor size, ORT, EBL, and LOS between PHEs and ALDs. Like the overall analysis, subset analysis of right-sided lesions demonstrated that there was a significant difference between PHEs and ALDs in tumor size and ORT. Right-sided PHEs were larger than right-sided ALDs (5.3 ± 1.8 vs 3.0 ± 1.5 cm; P = .001). The ORT for right-sided PHEs was longer than that for right-sided ALDs (198 ± 44 vs 145 ± 37 minutes; P = .005). Comparing left- and right-sided lesions within the PHE group, there were no significant differences in tumor size, ORT, EBL, and LOS. Comparing left- and right-sided lesions within the ALD group, there again were no significant differences in tumor size, ORT, EBL, and LOS. Pearson correlation analysis within the PHE group demonstrated that there was a significant correlation between EBL and ORT (r = 0.535; P = .01) and between ORT and LOS (r = 0.441; P = .05). Within the ALD group, Pearson correlation analysis demonstrated significant correlation between EBL and ORT (r = 0.541), between ORT and LOS (r = 0.531), and between EBL and LOS (r = 0.953; P = .01 for all). Conversion to an open adrenalectomy was performed in 1 patient with a PHE for intraoperative hemorrhage. One patient who underwent LA for ALD also required conversion to an open procedure for intraoperative hemorrhage. Concomitant procedures were not performed in any of the patients undergoing LA for PHE. However, concomitant procedures were performed in 3 patients undergoing LA for ALD: a laparoscopic inguinal hernia repair and cholecystectomy, an umbilical hernia repair, and an open cholecystectomy. Intraoperative ultrasound was used in 4 LAs (1 of the 26 PHEs and 3 of the 34 ALDs). The incidence of major complications was higher in patients undergoing LA for PHE vs ALD (P = .13). Six patients with PHE and 3 with ALD had major complications. Hemodynamic instability, bacteremia, prolonged ventilation, pneumothorax, hemorrhage, and liver laceration occurred individually in 6 patients with a PHE. In contrast, biliary leak (secondary to a concomitant procedure), urinary retention, and umbilical trocar site hernia (secondary to a concomitant procedure) occurred individually in 3 patients with an ALD. The postoperative LOS was longer for patients with a PHE than for those with an ALD (4 ± 4 vs 2 ± 3 days; P = .08). Laparoscopic adrenalectomy is performed for a variety of adrenal diseases. Two such indications are ALD and PHE. Aldosteronoma has been one of the most common indications for LA. However, in some series,3,7-9 PHE has been the most frequent indication for LA. Laparoscopic adrenalectomy for PHE offers some technical advantages owing to its improved ability to visualize the contiguous anatomy and its relationship to the adrenal tumor. The decreased manipulation of the tumor during dissection of the adrenal gland has been espoused as another benefit of the laparoscopic approach. The decreased release of catecholamines and the resultant attenuation in hemodynamic lability has been a purported advantage of the laparoscopic approach.6,10-12 Brunt and colleagues,9 postoperatively, validated LA as an adequate means of resection by confirming the biochemical resolution of excess hormone secretion by the adrenal lesions removed using this approach. The initial 35 LAs, not all of which were performed for PHEs or ALDs, were excluded from the data analysis of this study. The learning curve for LA has been reported7 to be approximately 25 to 30 cases. Thirty-five cases were determined to be sufficient for learning LA in this study, as it was believed to reflect complete familiarity with LA among the surgical, anesthesia, and ancillary staff. After the initial 35 cases, LAs were performed by the same anesthesiology and ancillary team. Laparoscopic adrenalectomy was associated with larger and predominantly right-sided PHEs and smaller and predominantly left-sided ALDs in this study. Rutherford et al4 reported a nonsignificant increase in the ORT for the removal of right-sided tumors vs left-sided tumors. Of their 67 patients, 52 had hyperaldosteronism, and 6 had PHEs. Five of the 6 PHEs were right sided and 32 of the 52 ALDs were left sided.4 In an early Mayo Clinic5 experience with 9 left-sided adrenalectomies, 7 were performed for ALDs. In the initial experience of Gagner et al,7 the resection of right-sided adrenal lesions required a slightly increased ORT. However, with increased experience, there was no discrepancy between left- and right-sided LA.7 Contrary to some results,13 most PHEs removed laparoscopically in this study were on the right side. In an analysis of open adrenalectomy vs LA by Inabnet and colleagues,14 8 of 11 LAs were performed on right-sided lesions measuring 4.1 ± 1.2 cm. In the present study, the average size of the PHEs removed was larger than the average size of the ALDs removed. The larger size of the PHEs may have accounted for the longer ORT. In the experience of Cheah et al15 with 39 PHEs, 17 were discovered incidentally. The mean size of these tumors was 5.1 cm, which was similar to the mean tumor size in the present study and greater than that reported by Brunt and colleagues9 (3.4 ± 1.3 cm). In the experience of Kercher and colleagues13 with LAs for PHE, lesions had a mean size of 5.2 cm. The ORT for the laparoscopic resection of PHEs vs ALDs in this study was 191 ± 49 vs 162 ± 48 minutes. Acceleration of laparoscopic skills along the learning curve has been thought to occur after approximately 25 LAs. In the data analysis used in this study, the exclusion of the first 35 LAs most likely represents an adequate departure from the issues of the learning curve. Therefore, the significant difference reported in this article represents a clinically relevant and realizable difference between mean ORTs. Significant differences in ORTs have been reported16 between the initial 20 LAs and subsequent LAs in a series of patients with adrenal tumors. One concomitant procedure was performed with LA for PHE, whereas 3 concomitant procedures were performed with LAs for ALDs. If concomitant procedures are excluded, the difference between ORTs may be even greater, as concomitant procedures would intuitively increase the overall length of an operation. This is consistent with an earlier finding from our group3 involving 11 LAs, 9 of which were for PHE. The ORT for these 11 LAs was 212 ± 77 minutes.3 The median length of pneumoperitoneum was 195 minutes in the series by Col et al10 of 8 patients undergoing LA for PHE. Brunt and colleagues9 also demonstrated longer mean ORTs for PHEs than for ALDs; in their series of 72 patients, including 35 PHEs and 29 ALDs, they reported an ORT of 170 ± 60 minutes. Improved ORTs with LA have been noted in previous studies2,17 comparing open adrenalectomies and LAs. In a smaller study, Fernandez-Cruz et al11,18 demonstrated no difference in ORTs between patients undergoing LA for PHE vs ALD. An explanation for the longer ORTs in this study may be found in the larger mean size of the lesions removed. In the present clinical investigation, there was an increased requirement for transfusion of blood products in patients undergoing LA for PHEs vs ALDs. This increased transfusion requirement occurred despite the absence of a significant difference in EBL between the 2 tumor types. Among the patients in each group who did not require transfusions, EBL was similar. Overall, most patients in the PHE group requiring transfusion experienced greater EBL than those not requiring transfusion. There were simply more patients who underwent transfusion in the PHE group than in the ALD group. This is reflected in the fact that although there is not a significant difference in EBL between the PHE and ALD groups, there is a trend toward increased EBL in the PHE group. The policy to transfuse patients was based on multiple clinical variables, including EBL. In the study by Brunt et al,9 patients with PHEs also had greater EBL than those with adrenocortical hormone–secreting tumors. Likewise, transfusions were given only to PHE patients. Fernandez-Cruz et al11,18 noted no difference in EBL between PHEs and ALDs. The postoperative LOS in this series for predominantly left-sided ALDs was 2 ± 3 days, which is consistent with the finding from Schlinkert et al5 of 2.3 days after left-sided adrenalectomy. In this study,5 PHEs were associated with a longer postoperative LOS of 4 ± 4 days. In previous studies,3,5,9,19 mean LOS for LA typically has been greater than 2 days. In the retrospective study by Gagner et al20 of 17 patients undergoing LA for PHE, postoperative LOS was 5.7 days; they attributed this prolonged hospitalization to cautious postoperative care of the initial patients undergoing LA for PHE given its relative novelty at that time. Other studies6 have also documented a slightly prolonged LOS after LA for PHE. Col et al10 noted a postoperative LOS ranging from 4 to 11 days, including 3 patients with complications. Their average LOS was slightly greater than the postoperative LOS reported in the present series. Fernandez-Cruz et al11,18 noted no difference in postoperative LOS between PHEs and ALDs. In previous studies,10 complication rates for LA have ranged from 0% to 33% and have included arrhythmia, hematoma, wound infection, renal ischemia, and renal hemorrhage. Long-term complications of trocar site herniation16 and trocar site implantation of metastatic disease have also been described.12 In the present investigation, the complication rate after LA for PHE was 23% (6 of 26 patients). In comparison, the complication rate after LA for ALD was 9% (3 of 34 patients). In this series, 1 of the 26 LAs for PHE and 1 of the 34 LAs for ALD were converted to open procedures. In the review by Gagner et al20 of 42 patients undergoing LA for PHE, a complication and conversion rate of less than 5% was reported. The lone conversion occurred for bleeding. Conversion rates for LA have been reported19 to range from 0% to 38%. In this series and several others9,13,14 of hormonally active tumors, no perioperative mortalities occurred with LA. Communication between the surgery and anesthesiology teams preoperatively, intraoperatively, and postoperatively resulted in the low rate of anesthetic complications with LA in this series. The cooperation between these teams was especially advantageous during LA for PHEs. The patients in this study were routinely monitored using standard American Society of Anesthesiologists methods, including pulse oximetry, electrocardiography, noninvasive blood pressure measurements, endtidal capnography, and esophageal temperature probes. In addition, all PHE patients were monitored using an intra-arterial catheter and central venous catheter for sudden changes in blood pressure and fluid management, respectively. The patients underwent general anesthesia with a combination of nitrous oxide, oxygen, and sevoflurane. Because LA for PHE requires tumor manipulation that may cause hemodynamic instability, nitroprusside was used to control high blood pressure and esmolol hydrochloride β-blockade was used to control tachycardia. From the anesthesiologist's perspective, the laparoscopic removal of PHEs provided the added advantage of visualizing what the surgeon was doing. Therefore, this helped in the intraoperative management of hemodynamic changes and fluid administration, including the transfusion of blood products. This investigation demonstrates that LA for PHE can be associated with greater difficulties intraoperatively and postoperatively than LA for ALD. This can translate into greater challenges during an advanced laparoscopic procedure. As the actual number of LAs performed during surgical residency training has not markedly increased, the training for this procedure may be inadequate for more complex circumstances, such as PHEs. The intention of this investigation was to highlight the differences between LA for PHE and ALD. These findings should not be misconstrued as guidelines for when to perform LAs for ALD. That is, the performance of a specific number of LAs for ALD should not serve as a milestone acknowledging promotion to the performance of LAs for PHE. The surgeon planning to perform LA should be well prepared by using simulators and trainers for advanced laparoscopic techniques, observing videotapes and live procedures, and being properly proctored by an experienced surgeon before performing this demanding procedure. 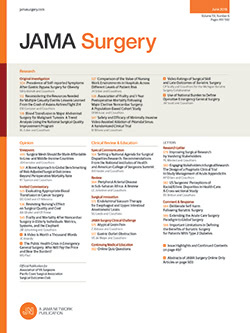 For the surgeon beginning to perform LA, adrenocortical tumors seem to have improved outcomes and, therefore, may be more appropriate for learning the procedure and techniques of LA. Once the surgeon becomes more facile with LA, the challenges posed by a PHE can be better handled. Performance of concomitant laparoscopic or open procedures should be deferred until competence and confidence with LAs are achieved. Corresponding author and reprints: Richard A. Prinz, MD, The Helen Shedd Keith Professor and Chairman, Department of General Surgery, 785 Jelke, Rush University Medical Center, 1653 W Congress Pkwy, Chicago, IL 60612 (e-mail: rprinz@rush.edu). Accepted for publication January 22, 2004. This paper was presented at the 111th Scientific Session of the Western Surgical Association; November 12, 2003; Tucson, Ariz; and is published after peer review and revision. The discussions that follow this article are based on the originally submitted manuscript and not the revised manuscript. We thank Linnea S. Hauge, PhD, for her assistance with the statistical analysis. Jon van Heerden, MD, Rochester, Minn: Since the introduction of laparoscopic adrenalectomy a decade ago, the limits of this operation continue to be pushed. An unfortunate surgical machoism has become evident worldwide, characterized by the dual philosophy of "our/my conversion to an open procedure is a rare event indeed" and the even more dangerous philosophy of "I/we can remove a larger adrenal tumor laparoscopically than you can." It is thus refreshing to receive a clear cautionary message from one of the true leaders in this rapidly evolving surgical field. Dr Prinz's group compares for us patients undergoing laparoscopic adrenalectomy for a pheochromocytoma with those having the procedure for an aldosterone-producing adenoma. They found that surgery for pheos is more difficult than that for aldos. Could this be due to the larger size of the pheochromocytomas (4.9 vs 2.7 cm) or due to the fact that 73% of pheochromocytomas were right sided in contrast to 85% of aldosterone-producing tumors being left sided? I was unaware of this right vs left-sided phenomenon for pheochromocytomas but did find that 67% of a recent series of such tumors at our institution were also on the right. We know that the increased difficulty is probably not due to catecholamine release alone. A classic study from Spain demonstrated that catecholamine release increased 34-fold during open resection of pheochromocytoma in contrast to only a 17-fold increase during laparoscopic resection. The excellent results are most likely due to their team's expertise per se. This is reflected in only a single conversion (4%) in their pheochromocytoma patients, which contrasts to a 10% conversion rate in a series of patients operated upon by our group. The "learning curve," a term I dislike, for laparoscopic adrenalectomy is approximately 25 cases. Endocrine surgeons should cut their teeth by operating early on, on patients with aldosterone-producing adenomas, which are smaller and predominantly left sided. Communication between the surgical and anesthesia teams pre-, intra-, and postoperatively is essential when operating on patients with pheochromocytomas. Surgeons planning laparoscopic adrenalectomy need to be well-prepared for this complex procedure by a combination of simulator training, surgical observation, and surgical proctoring. Because of the rarity of this procedure, residency training is probably inadequate to allow for the performance of laparoscopic adrenalectomy for pheochromocytomas by current graduating surgical residents. Richard, the golden rule in open adrenalectomy for pheochromocytoma is that of minimal tumor manipulation and early vein ligation. Can this rule be followed in most patients undergoing laparoscopic resection? Since you accurately state that the low volume of adrenal surgery does not allow for adequate resident education, is this an operation which should be regionalized? Was it fair from an analytical viewpoint to exclude your initial 35 laparoscopic adrenalectomies from this study? This exclusion resulted in the deletion of four pheochromocytomas and 11 aldosterone-producing adenomas for analysis. Knowing you, though, I would venture a guess that the surgical result in these 15 patients was outstanding. Dr Prinz: The fact that Dr van Heerden is not here yet he did take the time to put together his discussion and make sure that it was read by Dr Farley is really an acknowledgment of the special type of individual he is. Please convey my thanks to him. The standard teaching for removing pheochromocytomas is to minimize the amount of tumor manipulation and to ligate the adrenal vein as early as possible. You alluded to the study from Fernandez-Cruz in Barcelona, Spain, which suggests that there is less manipulation of pheochromocytomas because there is less catecholamine release with a laparoscopic approach. On the right side, after we have mobilized the liver so we can visualize the adrenal gland and identify the vena cava, our first maneuver is to dissect out the right adrenal vein and ligate it as early as possible. On the left side, it can take a bit more time to get down to the adrenal vein, but we still try to identify and ligate it as soon as possible. I think we manipulate the tumor much less with the laparoscopic approach than when we were grabbing it and retracting it with our hands. The laparoscopic approach facilitates early vein ligation and minimizes tumor manipulation, so, if anything, it allows us to be more true to our dictums. The second question concerned regionalization of adrenal surgery. Obviously, this is a timely, yet very sticky, issue. Volume and outcomes are things that are being looked at more and more. Adrenal surgery is certainly a low-volume item, and it's something that is not going to be seen in the usual career of a general surgeon very often if at all. If you are going to be doing these types of operations, you should have the appropriate laparoscopic skills and talent and you should have a thorough understanding of the underlying adrenal disease. You should have an experienced anesthesiology team with the skills that are needed to handle these patients so that you can focus on the technical aspects of your operation. They should be able to manage cardiovasculation changes so the surgeon does not have to worry about the hemodynamic aspects. We have to teach our residents that they should do the right thing and not have a macho attitude. Just because they are seeing a patient who has a problem requiring an operation that they want to do does not mean they should do it. If they have the laparoscopic skills and knowledge of endocrine disease and the appropriate anesthesia team, they probably can proceed. Otherwise, they should be referring these patients to centers that have the experience and expertise. Dr van Heerden asked about the 35 patients including the 4 pheochromocytomas and 11 aldosteronomas that we excluded at the beginning of this study. We did this for a number of reasons. These patients seemed to have a higher percentage of concomitant procedures performed with the adrenalectomy. More importantly, their exclusion didn't really change our results. When you are presenting these data you are asked often about the learning curve. To deal with that issue a priori, we excluded those patients. Michael K. McLeod, MD, Kalamazoo, Mich: It wasn't mentioned in your complications for your pheochromocytomas, but have you had any instances where you have disrupted the capsule of the pheochromocytoma or adrenal mass during laparoscopic excision? If you have had no experience with that, do you think that the inadvertent disruption of the capsule of the pheochromocytoma during laparoscopic excision is associated with a higher recurrence rate? If the capsule of the pheochromocytoma is disrupted during excision, do you recommend managing them any differently, or do you think no special attention to this occurrence is necessary? Also, you mentioned that you had to convert 2 of your cases because of bleeding. Was the bleeding in those cases from the adrenal vein or from another source? Dr Prinz: With pheochromocytoma, you are never really sure if you are dealing with benign or malignant tumor. The one conversion we had with pheochromocytoma was from bleeding from the tumor itself. There was a break in the capsule, and this was the source of bleeding. This type of bleeding is very difficult to control in a safe manner. When the capsule is broken, the best thing to do is to convert to make sure that you are getting the tumor out and not seeding any tumor tissue. I have had one episode of bleeding from the adrenal vein. That was before the patients in this series. You certainly have to convert real quickly when that occurs. Raymond J. Joehl, MD, Hines, Ill: My questions relate primarily to patient selection and specifically to when you don't recommend laparoscopy. Is there an adrenal tumor size greater than which you will not recommend a laparoscopic approach? How do you manage bilateral adrenal tumors? What do you recommend to patients who might have an extra adrenal pheochromocytoma? Related to training and specifically to you, Dr Prinz, what did you do to prepare yourself to do these cases laparoscopically? Dr Prinz: Bilateral disease is a distinct minority of the patients who are seen with adrenal problems that are appropriate for laparoscopic surgery. The most common indication is, of course, Cushing's disease. I have only had one such patient. I have had another patient with an MEN (II) syndrome who had bilateral pheochromocytomas. The usual approach is to do these at the same sitting. There is a posterior approach for laparoscopic adrenalectomy. I have tried it in the past but have not been pleased with it, so if we are presented with a patient with bilateral disease, I would usually do the largest side first and then switch the patient's position to do the contralateral side. Obviously, if you are having problems with the first one, this can either be staged or you can convert to an open procedure to get the operation completed. With regard to extra-adrenal pheochromocytomas, you should consider that the likelihood of malignancy is going to be greater, so you should have a more cautious approach. Also, these tumors can be very intimately related to vessels coming off of the aorta, such as the inferior mesenteric and superior mesenteric arteries. It may be much more difficult to recognize the position of these vessels laparoscopically. So again, I would be very cautious and I would be much quicker to convert to an open approach with an extra-adrenal pheochromocytoma. It is much more difficult to be sure of the anatomy with an extra-adrenal pheochromocytoma. With regard to size, I use a cutoff for cortical lesions of 6 cm. I certainly would not approach a cortical lesion that was larger than 6 cm by anything but an open approach. I am a little bit more lenient for pheochromocytomas and would consider removing a 7- or even 8-cm lesion laparoscopically because you still may be dealing with a benign condition. If I am having any technical problems whatsoever or find any suspicion of malignancy, I would be quick to convert. When I learned laparoscopic adrenalectomy, all of the educational tools that we now have were not available. I was doing open adrenal surgery, and I knew a lot about the involved endocrine physiology and the anatomy of the adrenals. I had been doing laparoscopic surgery and had instituted laparoscopic cholecystectomy when I was at Loyola. I started with a left-sided lesion and went ahead. Fortunately, I was able to get started without much difficulty. Obviously, our patients and our residents deserve better training than I had when the procedure was initiated. Steven A. Dejong, MD, Maywood, Ill: Your study focused on the local effects, tumor size, operative time, and blood loss of laparoscopic resection of these 2 types of adrenal tumors. Is there anything about the magnitude of hormone secretion or type of hormone made by each of these individual tumors that would also account for some of the differences that you observed? Second, how many of your patients in the pheochromocytoma group had malignancy? Did that account for some of the more difficult operations that led to your conclusions? Third, did you introduce any technique changes during the time of your study or utilize different laparoscopic equipment, such as the harmonic scalpel, that might explain some of the differences you observed? Lastly, did any of the patients in either group develop the rare complication of adrenal insufficiency after unilateral adrenal resection? Dr Prinz: The first question was about secretion, and I presume this relates to the pheochromocytomas. All of our patients do have secretion, high secretion of hormones during the operation, even though we try not to manipulate and try to ligate the adrenal vein. There is cardiovascular liability involved in this, and we, as I have said, have been very fortunate to have had the same anesthesia team dealing with all of our pheochromocytomas while I have been at Rush. I think that is the key to safety is having a team approach here who knows how to handle both hyper- and hypotension during the operation. Basically, you need to focus on what you are doing here technically, and if you have to be worried about those things or don't have the confidence in your anesthesia team to take care of them, it's a distraction that you should try to eliminate. The other question was about malignancy. We have not had any patients come back with malignancy as yet. That probably is a matter of good fortune. I tell all of my pheochromocytoma patients, you have to have an annual visit, an annual check of your catecholamine levels. It has been much easier to do that with the ability to measure plasma, metanephrines, and normetanephrines, but so far we have not had a recurrence in this group of patients. I have had a recurrence in patients with open surgery that we thought we completely resected who have come back with recurrence. With regard to the technique aspects, the technique has evolved. When we first started doing this, we used large 10-11 trocars on 4 trocar sites on each side. We now use just one 10-11 trocar on the left and 2 smaller 5-mm trocars on that side to do the procedure. We still use 4 trocar sites on the right but will make at least 1 or 2 of these 5-mm port sites. The other things: I do use the harmonic scalpel more. I do that not so much because it is a necessity but because our residents need to get familiar with that since more advanced laparoscopic procedures utilize that technology so it is mainly for teaching rather than a necessity of the operation itself. And about adrenal insufficiency, in these particular patients we did not have one, but I have had a recent one (I can't remember the side of this), but this was a larger adrenal lesion that we were taking out thinking that it was a nonfunctioning cortical adenoma that had grown in size. That patient had a bout of adrenal insufficiency and responded to steroid administration. So it is something you have to have in the back of your mind when you are doing this.